Lamps emit light when an electric current passes through them. All of the lamps shown on this page have a thin wire filament which becomes very hot and glows brightly when a current passes through it. The filament is made from a metal with a high melting point such as tungsten and it is usually wound into a small coil. Filament lamps have a shorter lifetime than most electronic components because eventually the filament 'blows' (melts) at a weak point. There are two circuit symbols for a lamp, one for a lamp used to provide illumination and another for a lamp used as an indicator. Small lamps such as torch bulbs can be used for both purposes so either circuit symbol may used in simple educational circuits. Voltage rating - the supply voltage for normal brightness. Power or current rating - small lamps are usually rated by current. Lamp type - please see the table below. The voltage and power (or current) ratings are usually printed or embossed on the body of a lamp. This is the supply voltage required for normal brightness. If a slightly higher voltage is used the lamp will be brighter but its lifetime will be shorter. With a lower supply voltage the lamp will be dimmer and its lifetime will be longer. The light from dim lamps has a yellow-orange colour. Torch lamps pass a relatively large current and this significantly reduces the output voltage of the battery. Some voltage is used up inside the battery driving the large current through the small resistance of the battery itself (its 'internal resistance'). As a result the correct voltage rating for a torch lamp is lower than the normal voltage of the battery which lights it! For example: a lamp rated 3.5V 0.3A is correct for a 4.5V battery (three 1.5V cells) because when the lamp is connected the voltage across the battery falls to about 3.5V. These are the standard small lamps. 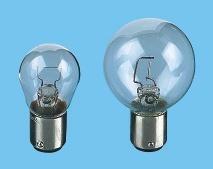 The bulb diameter is usually about 10mm, but tubular bulbs are also available. MES lamps have one contact on the base and the body forms the other contact. They are available with a good range of voltage and power (or current) ratings. Lens ended versions are available to produce a focused beam of light. Smaller than MES, these have a bulb diameter of about 5mm. These have a bayonet style fitting, like a standard mains lamp in the UK. They have one contact on the base and the body forms the other contact. The bulb diameter is about 10mm. These have a bayonet style fitting, like a standard mains lamp in the UK. They have two contacts on the base so the metal body is not connected in the circuit. SBC lamps have high power ratings (24W for example) and their bulbs are large with a diameter of up to about 40mm. Note the two filament arrangements in the lamps shown, horizontal on the left, vertical on the right. This type of lamp is used in torches and lanterns. The flange at the top of the metal body is used to hold the lamp in place. Lampholders are not readily available so this type is unsuitable for most projects. These are very small lamps with a bulb about 3mm diameter and 6mm long. Take care to avoid snapping the wires where they enter the glass bulb. These are similar to the wire ended lamps above but they have stranded wire leads usually about 150mm long. The bulb is about 3mm diameter and 6mm long - the size of a grain of wheat! Lamps may be connected either way round in a circuit and the supply may be AC or DC. Most lamps are designed to be used in a lampholder but the small 'wire ended' and 'grain of wheat' lamps have wires which may be soldered directly onto a circuit board. Lampholders usually have screw terminals or solder tags to attach wires. Some small holders have contacts which may be soldered directly to a circuit board. Several lamps can be successfully connected in series provided they all have identical voltage and power (or current) ratings. The supply voltage is divided equally between identical lamps so their voltage rating must be suitable for this. For example Christmas tree lights may have 20 lamps connected in series to a 240V supply, so each lamp will have 240V ÷ 20 = 12V across it. A disadvantage of connecting lamps in series is that if one lamp blows all of them will go out because the circuit is broken. Christmas tree lamps have a special feature to overcome this problem; they are designed to short circuit (conduct like a wire link) when they blow, so the circuit is not broken and the other lamps remain lit, making it easier to locate the faulty lamp. Sets also include one 'fuse' lamp which blows normally.